Did you forget to logout your Facebook account in someone’s device or at cyber cafe? Do you think that someone else is using your Facebook account without your permission? So, for all these problems with your Facebook account, there is no need to worry because you can easily remotely log out your Facebook account from your home on every other devices where your Facebook account remained open and being accessed without your permission. This is really very useful trick that will be helpful when you forget to log out Facebook in cyber cafe and unfortunately you’re out of town. In this condition you can remotely log out your Facebook account from anywhere on any other devices. 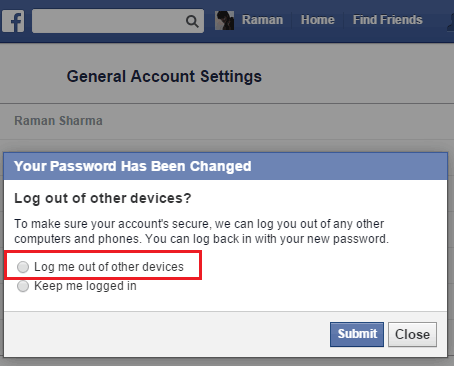 Now, it’s time to learn how to remotely logout Facebook account on other devices. Not only this, you can also find out the location where your Facebook account was running in other’s hand. For this, I’ve two methods to logout Facebook in all other devices where even you can’t reach. Both of these methods are effective and easy to perform and the first method (Listed First) is most prominent because by this method, you’ll also find the location where your account was operating. Is it Possible to Logout WhatsApp in Android? Yes, friends you can easily remotely logout your Facebook account from anywhere around the world by modifying your security settings. To do this, first of all, log in to your Facebook account in your device, Click on the Triangular icon on the Facebook notification bar and Choose Settings. Now, Click on Security in the left panel of screen and then look for the term Where You’re Logged In (in the right section) and click on Edit link in front of it. Next, inside the Where You’re Logged In section, you’ll see your account activity if any unfamiliar device would be using your account. Here you’ll also see when your account was last accessed and what is location where your account was operating. So, if you find any unfamiliar device using your account, then just click on End Activity link to remotely logout of all other devices (as shown in the following screenshot). That’s all guys! As you will click on End Activity, your account will be logged out automatically from than device and nobody can access your Facebook account from that device anymore. Changing your Facebook account password is very easy and common task and everybody should be changing it time by time. I strongly recommend you to change your Facebook account password regularly (Once a month). The main reason and profit of changing the password is that whenever you change your Facebook account password, you can remotely logout your Facebook account from all other devices on just a click. So, again click on the Triangular Icon on the Facebook notification bar and choose Settings. In the right side of screen, you’ll see the Password section. Click on Edit in front of Password. In the next step, enter your current password and then choose a new password for your account and click on Save Changes. After saving changes, you’ll see two options asked by Facebook. First is to Log out of other devices remotely and other one is to keep logging in. Simulate the following picture and click on Log me out of other devices. That’s it friends! After submitting this information to Facebook, your account password will be changed and you’ll be remotely logout of all other devices around the world. Ohh..I knew that but never thought about it..I can do it by simply changing my password. How simple it was! Thanks.